30A Vacation Rental in Seacrest with Golf Cart, glimpse of the gulf from the balcony, short walk to beach! 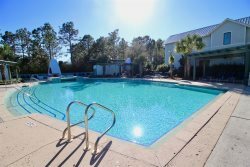 Located a short distance from Alys, Seacrest and Rosemary Beach, 29 Tranquil Way is close to action yet not in the middle of the action. Nestled in a small neighborhood in Seacrest West, this 3 bedroom, 3 bath home will become your favorite beach vacation home. This home is pet friendly so you can bring your best friend along on vacation! As you enter the home, you are greeted by the shabby chic beach decor. The open area of the living room, dining room, and kitchen provide the ideal space for hanging out as a family or with friends. The screened in porch, located just off the living room, features 2 bed swings. Relax here after a long day at the beach with a cocktail and share your favorite beach adventures from the day. There is a sleeper sofa for added space. Just off the kitchen, is a king guest room, a twin trundle and a shared bath. This spacious room has a flat screen TV and access to the screened in porch. Perfect for those who prefer not to deal with the stairs daily. Head upstairs to find the other 2 bedrooms. The master features a king bed, twin trundle, flat screen TV, large closet, and en-suite bathroom with tub/shower combination. Wash all your cares away in the spa soaker tub. Step out onto the 2nd floor balcony and enjoy a beautiful glimpse of the gulf! The other bedroom upstairs has 2 queen beds, private en-suite bath with tub/shower combo and direct access to 2 balconies. The first balcony is shared with the master and features those beautiful gulf views. The second balcony is private and overlooks the backyard. From the shared 2nd level balcony, wind your way down the spiral staircase to the side yard. The grill master in your group will have the choice of charcoal or gas to prepare your dinner feast. Dine al-fresco on the outdoor dining table. There is a beautiful outdoor seating area well lit, with a fire pit to enjoy. This is a beautiful area to enjoy the outdoors while vacationing! There is also an outdoor shower in the backyard. This home is just across from the community pool and is very close walking distance to the public beach access. Don't feel like walking? Hop into the the brand new, street legal golf cart that seats 6 people. You might just by-pass the beach and head on down to the Hub 30A for a little shopping and great food. Another option is to peddle down to the beach access on the 3 bikes provided. Getting around on 30A couldn't be easier! Come experience a vacation of a lifetime at "Let It Bee"! 4) To utilize the golf cart, waiver must be signed and received before code provided. Driver must be 16 years old and have a valid drivers license.